The Navajo Ye-i, also often spelled yeii or yei, are something along the lines of spirit, god, demon, or monster. According to what is known of the Navajo origin story, these spiritual beings emerged from the lower worlds before the creation of the human race. At times they are referred to as Holy People. These Holy People are immortal beings that can take the form of animals, plants, landscape elements, or celestial bodies, but are viewed as supernatural beings and not deities. They are called holy because of their power and mystery and the fact that they live in the sacred realm. Because the Navajo believe that the land, the immortal beings, and they themselves on earth are all connected, they strive to live life according to hozho, which translates roughly to harmony, balance, and beauty. The Ye-i can be called down to earth through ceremonies, rituals, and prayers and asked to help restore hozho when things fall out of balance. Ye-i are often drawn in sandpaintings during certain healing ceremonials, and depending on the ritual, Ye-i masks may be worn by participants to represent the supernatural beings. If the ceremony is performed in the correct way, and the Ye-i are pleased, then according to the belief they feel obliged to right the wrong that is disrupting the harmony or cure the sick patient. 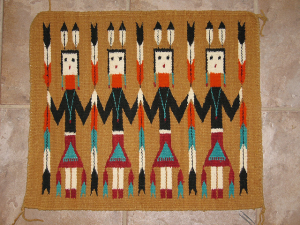 "Yei-bi-Chai: A Navajo rug depicting yei figures, March 4, 2007" by miheco is licensed under CC BY-SA. 1946 The Navaho. Cambridge: Harvard University Press.